I just returned from a trip to Los Angeles. While there, I went to the Tonight Show with Jay Leno. On the way to the taping, I had to pull over to allow a fire engine to pass by. After driving over the mountain and into the Valley where Warner Brothers and NBC Studios are located, I saw a gigantic fire! This fire was quite close to the studio; in fact Jay mentioned it in his monologue. We were right in the middle of the action. The ash was in the air, on my car and even got a little on my jacket. 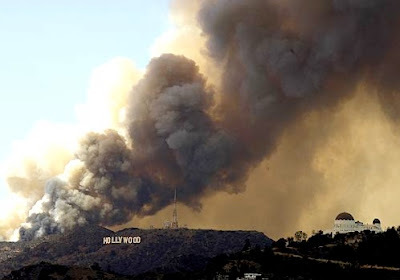 Luckily no one hurt, but you can see, like many things in Hollywood, very dramatic. I like Los Angeles, but it's good to be home.